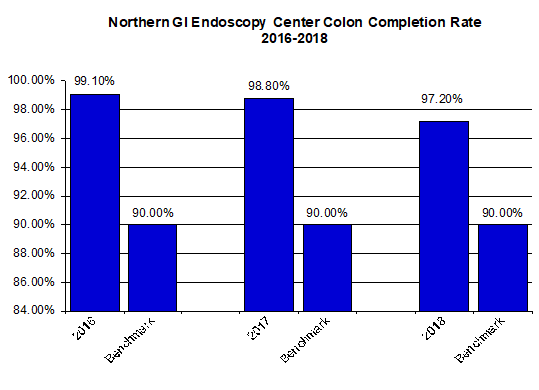 Northern GI Endoscopy Center is committed to achieving and maintaining the highest clinical quality standards. We have developed a Quality Improvement program that uses well established measures. The results which have been obtained reflect our excellence in GI endoscopic care. Our program regularly incorporates feedback from our referring physicians, and the patients we serve. For the past 10 years, greater than 98% of our patients have suggested that they would recommend utilizing our facility to family and friends! Prevention of cancer is a primary goal in much of the care provided at our facility. As an example, patients undergoing an upper gastrointestinal endoscopy may be evaluated for the presence of a pre-cancerous condition called Barrett’s esophagus which is a risk factor for esophageal cancer. Those previously diagnosed with Barrett’s esophagus require biopsy surveillance to ensure that more worrisome changes have not evolved (dysplasia and cancer). Another example relates to our commitment to decrease our patients’ risk of colon cancer. Because colon cancer remains the second leading cause of cancer-related death in this country, we focus upon ensuring that a thorough and complete colonoscopy is afforded to those patients who present for screening examination. Recent scientific studies have highlighted several key metrics which are associated with the performance of high-quality screening. These metrics are included in our comprehensive program. It has been demonstrated that examination of the entire colon is directly related to reducing the risk of post-colonoscopy colon cancer.1 Measuring this is therefore an integral part of our quality program. It has been suggested by experts that the colon completion rate should exceed 85%. As shown in the following graph, our performance in this regard remains exceptional. The ability to both find and remove precancerous colon polyps (adenomas) at the same time has promoted colonoscopy to being the “gold standard” of colon cancer prevention strategies. 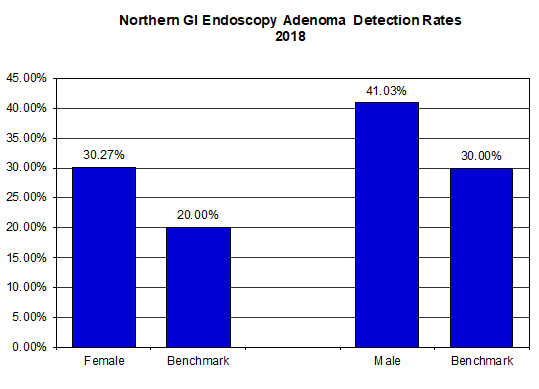 Long-term clinical studies have now proven that colonoscopic removal of adenomatous polyps not only decreases one’s risk of developing colorectal cancer, but it also decreases the risk of dying from this relatively common cancer.₂ The physicians who perform colonoscopy at Northern GI Endoscopy Center have consistently exceeded national benchmarks which have been set for the detection and removal of these precancerous colon lesions. Gastroenterology. 2011 Jan;140(1):65-72. Epub 2010 Sept 18.